THE GEAR: Jersey: Fly Racing Lite Hydrogen, Pants: Fly Racing Lite Hydrogen, Helmet: Fly Racing F2 Carbon Rewire, Goggles: Scott Hustle MX LS, Boots: Sidi X-3 SRS. Q: FIRST AND FOREMOST, IS THE 2019 CRF450 BETTER THAN THE 2018 CRF450? A: Better is a relative term, and so is faster. Since the 2019 CRF450 has a lot more power than the 2017 and 2018 CRF450s, it is faster and thus better. Q: WHEN DID HONDA CHANGE ITS PHILOSOPHY ON THE CRF450? A: Building a motocross bike from the ground up is an expensive proposition, and its success is closely tied to the fickle nature of the consumer, marketplace forces and pressure from competitors’ R&D programs. It’s no secret that Honda was pushed back onto its heels starting in 2009 by KTM’s massive investment in high-tech machines, the effects of the four-year-old recession that coincided with the release of its ambitious 2009-2012 Honda CRF450 design gamble, and the sudden consumer interest in light weight, electric starting and hydraulic clutches. A good R&D program is only as good as its understanding of the market demands and the philosophy behind the program. Unfortunately, Honda came up short with its four-year production cycle of the 2009-2012 model and the 2013–2016 replacement. Starting in 2017, Honda engineers and marketers realized that they needed not only a totally new bike but a new philosophy. Here are the three obvious signs of Honda’s new approach to the 2019 CRF450. (1) Reputation. Honda of Japan’s leadership took the race program back from the American division and put HRC in charge. They invested heavily in top-flight talent—in the form of Ken Roczen—and reorganized the management of the race team—bringing team manager Erik Kehoe back into the fold to try to regain the winning spirit that they had during their heydays with Ricky Carmichael in the saddle. It is obvious that Honda got serious about getting back on top in race wins, National Championships and bike sales. (2) Production cycles. Honda ash-canned the four-year development program that had been the hallmark of its production cycles for the last two decades. Unlike in the past, Honda’s R&D budget has been expanded to include yearly updates to the Honda CRF450 (starting with the new-generation 2017 model). Under the previous four-year production cycle, the 2017 model would have stayed essentially the same until 2021. Thankfully, Honda sped up the development cycle, making upgrades and improvements to the 2018 model and continuing the trend with the 2019 CRF450. (3) Slower is better. Starting in 2009 and continuing through 2016, Honda adopted a “slower is better” philosophy. During this eight-year period Honda’s engineers detuned the CRF450’s power output, focusing on making the engines more ridable by making them slower. The “slower is better” philosophy led them to produce engines that were as much as 5 horsepower weaker than their competitors’. There is no doubt that the CRF450 engines could have been so much better than they were, especially on the top-end, but the CRF450 philosophy of the time was to make them mellow. For 2019, that is no longer the case. Honda’s engineers kicked out the jams on the 2019 engine—and now it has 5 horsepower more than some of its competitors. Q: DO YOU KNOW THE HISTORY OF THE LATEST GENERATION CRF450S? A: Most racers know that the 2007 and 2008 Hondas were awesome machines, but Honda’s young engineers had a totally new idea for the 2009’s frame geometry. It was different from any other motocross bike ever made. It was called the “Cab Forward Design” because the 2009 CRF450’s front wheel was 15mm closer to the engine, the steerer tube was pulled back 10mm, the swingarm was 18mm longer, the fork offset was reduced from 22mm to 20mm, trail was decreased from 4.5 inches to 4.3 inches and the head angle was steepened from 26.76 degrees to 26.52 degrees. 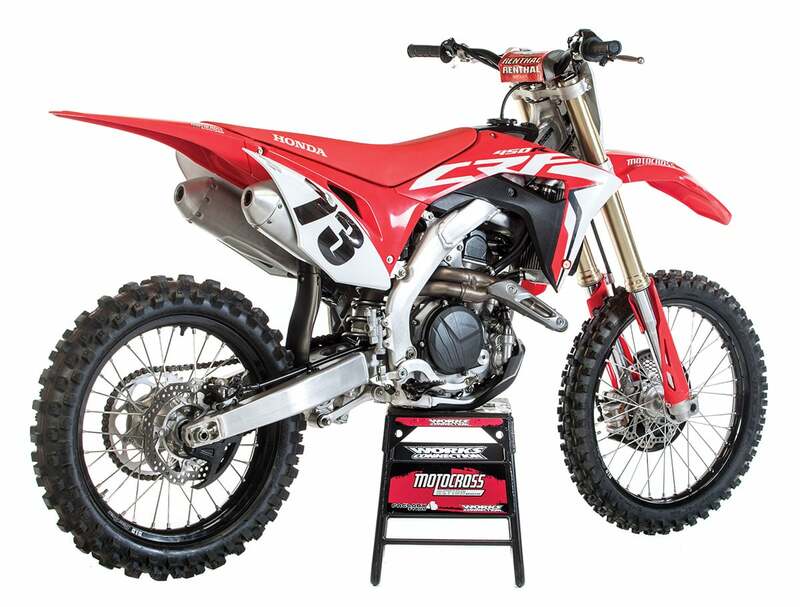 In short, every aspect of the 2009-2016 CRF450 was moved forward (by moving the front and rear wheels farther back in relationship to the engine position). This shifted the weight bias forward towards the steep head angle. This chassis setup was amazing at turn-in. Even the slightest movement of the bars would initiate a turn. But, it was too much of a good thing. The front tire oversteered in, which required a counter-steer correction, which resulted in understeer out and eventually more oversteer. It made a simple left-hand turn into three or four distinct movements of the bars. Cab-forward design dominated Honda’s DNA from 2009 to 2016. Q: WHEN DID HONDA ABANDON THE “CAB FORWARD” CONCEPT? A: By 2017, Honda came to its senses and dropped the cab forward concept. In fact, the engineers took a long hard look at the old-school 2008 Honda CRF450 frame geometry and tried to mimic the numbers, feel and sensations of the last highly regarded CRF450. The 2017 chassis undid the radical geometry changes that were introduced in 2009. The 2017 front wheel was moved forward 13.1mm; the swingarm was shortened to move the rear axle 23mm closer to the engine; the wheelbase was decreased by 7mm; the head angle was slackened to 27.22 degrees; the fork offset was returned to 22mm; and the trail was increased from 4.3 inches to 4.6 inches. In essence, the 2017 Honda CRF450 frame geometry had more in common with the 2008 numbers than any bike in the previous eight years. Q: WHAT CHANGES DID HONDA MAKE BETWEEN 2017 AND 2018? (1) Electric starting. Electric starting became a cause celebre for the Big Four Japanese brands in 2018. Honda and Yamaha jumped on board the “Better Living Through Electricity” train even though neither one of them could afford the 5-pound weight penalty that came with electric starting. In the Honda’s case, the 2018 CRF450 weighed 238 pounds. In 2017, it weighed 233 pounds. (2) Black box. In 2017, Honda CRF450 riders had issues with the stock mapping on the CRF450. For 2018, Honda downloaded a new map into the ECU. It lessened the herky-jerky low-end throttle response and cleaned up the low-to-mid transition. (3) Suspension. In-the-know 2017 Honda CRF450 racers upped the spring rates on the Showa forks from 0.48 kg/mm to 0.50 N/m and traded the stock 54 N/m shock spring for a firmer 56 N/m spring. Honda followed suit on the 2018 model with those exact same spring rates front and rear. (4) Head stays. For 2018, the CRF450 got thinner and flexier head stays. The head stays were narrowed to feed a more resilient feel into the aluminum chassis. Q: WHAT CHANGES DID HONDA MAKE TO THE 2019 CRF450? A: While the changes made to the 2018 Honda CRF were improvements, they were rather limited in scope. The 2018 CRF450 was basically the 2017 model with stiffer springs, electric starting and new mapping. These were positive steps—but just baby steps. By the time the 2019 CRF450 came through the design process in Honda’s R&D department, the engineers realized that another warmed-up 2017 CRF450 wasn’t going to be enough in the face of the 2019 bikes their competition had on the drawing boards. So, here is what Honda did for 2019. Engine. 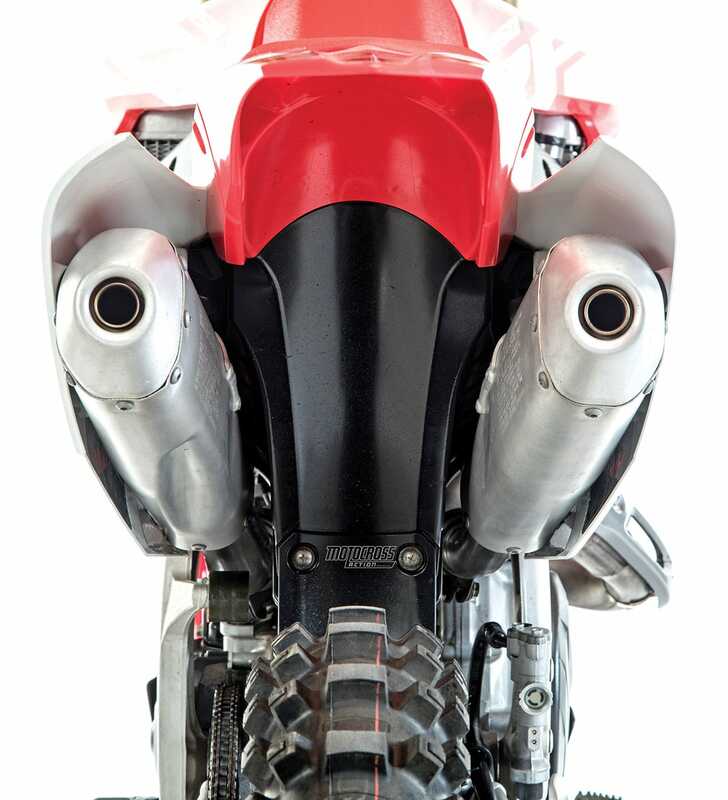 The CRF450 got an updated cylinder head design with a focus on the flow efficiency of the exhaust port. The clutch got a new lifter and pressure plate to maximize oil supply to the clutch plates. The old, single, 16mm scavenger pump was replaced with two 12mm pumps to increase engine lubrication, which in turn reduced friction in the moving parts. The mister nozzle that sprays oil on the underside of the piston was changed to an all-new five-nozzle configuration with a spray pattern that improved cooling efficiency and lessened pinging. The shift sensor, which tells the ECU what gear the CRF450 is in, was enhanced to deliver a different ignition and fuel map for each of the five gears. The engine cases were recast to eliminate the kickstarter boss (since the kickstarter was long gone). The downsizing of the cases made room for larger exhaust pipe diameters where the pipe passed through the frame. The previous 31.8mm mid-pipes were increased in diameter to 35mm and 43mm, respectively. In addition, total tuned length from the exhaust port to the end of the muffler was lengthened to 98mm on the right pipe and 187mm on the left pipe. Last, the three push-button maps were updated and launch control was added (by offering three different rev limiter settings). Suspension. The forks remain the same Showa coil-spring forks as in 2018 but with revised shim stacks, new wraparound fork guards and a special ultra-low viscosity fork oil. As for the rear shock, it rides on a revised rising-rate shock linkage and an all-new lighter and less-rigid swingarm. Chassis. Although the geometry numbers remain the same for 2019, the aluminum Delta-Box frame benefits from the improved suspension settings, more resilient swingarm and more potent powerband. The black anodized Renthal Fatbars are mounted 15mm lower on four-way adjustable bar mounts. The redesigned footpegs are 20 percent lighter and feature positive-draft mud cleaning. Brakes. The 2019 front brake uses a lighter Nissin front caliper equipped with one 30mm and one 27mm piston (last year’s CRF450 had two 27mm pistons). The unequal piston design was added to provide more modulation to the 270mm brake rotor. There is an updated front brake hose that resists fluid expansion for more precise braking. WHAT CHANGES SHOULD HONDA MAKE TO THE 2020 CRF450? 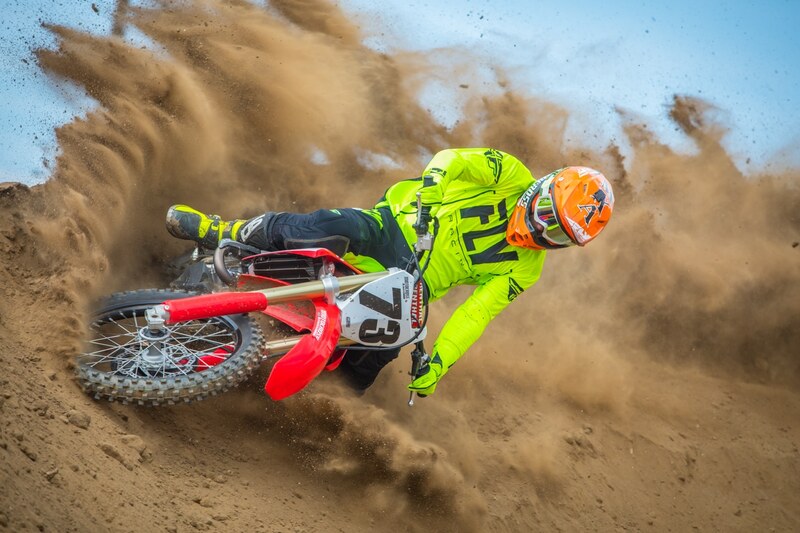 A: The MXA wrecking crew doesn’t work for Honda. We don’t design its bikes, balance its books or turn in two-martini expense accounts to the head office. We just race the bikes and, from racing them, we know the things that we would like to see on next year’s CRF450. (1) Clutch. We are now going on 11 years since Honda’s last good clutch. Honda has not had a workable, raceable or durable clutch since 2008. To make matters worse, Honda’s weak-sister clutch comes with the less-than-stellar judder spring system. We remove the judder spring and judder plate and replace them with one additional true-to-life fiber plate. (3) Exhaust pipe. Two mufflers make no sense on a bike that is already too heavy. 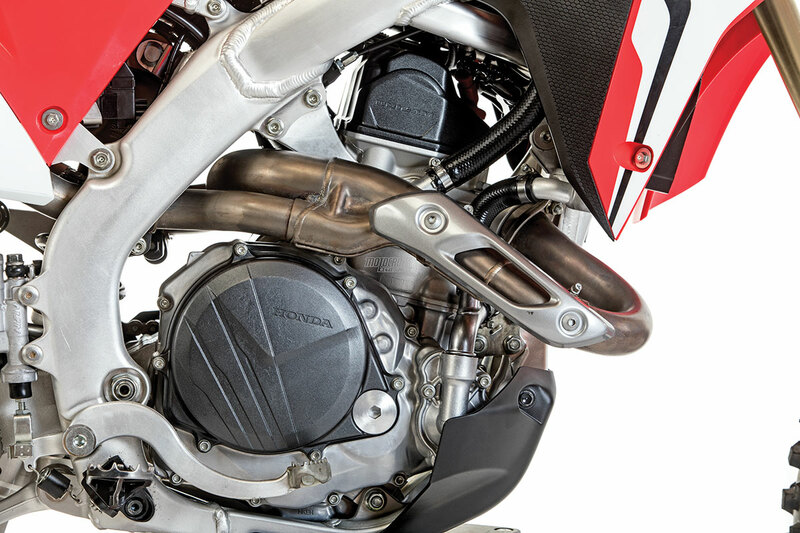 Most racers know that a single-sided FMF exhaust makes more power than Honda’s twin pipes, and the CRF450’s twice pipes carry a weight penalty that Honda can ill afford to ignore. Honda should focus on performance in every area possible—even in exhaust pipe configuration. (4) Titanium gas tank. We love the titanium gas tank, but we also know that the actual Ti parts are almost invisible and, when bolted to the perimeter frame’s two top tubes, it increases the rigidity of an already-too-rigid aluminum frame. It isn’t significantly lighter than a plastic tank. The gas cap sticks up. And the plastic cover over the tank is just redundant weight. (5) Radiator cap. MXA switches to a 1.8 or 2.0 kg/cm2 radiator cap to raise the boiling point of the radiator fluid. (6) Handling. We’d calm down the frame geometry more than the engineers did in 2017. Everybody likes a bike that turns in sharp, but nobody likes a bike that is exceedingly loose at speed. There is a happy medium. This engine is the most powerful production engine on the showroom floors in 2019. Q: IS THE 2019 CRF450 FASTER THAN THE 2018 CRF450? A: Not only is it faster than the 2018 Honda CRF450, it is faster than the 2019 YZ450F, RM-Z450, 450SXF, FC450 and KX450. How much faster? The 2019 Honda CRF450 is the most powerful CRF450 ever made. It pumps out 60.21 peak horsepower compared to the YZ450F’s 57.51, KTM 450SXF’s 57.14, Husky FC450’s 56.40, KX450’s 55.86 and Suzuki RM-Z450’s 54.39. Best of all, it makes power where no CRF450 in the last 10 years has made power—above 9000 rpm. Before 9000 rpm, the 2018 CRF450 and 2019 CRF450 are virtually identical; but, after 9 grand, it is no contest. In a direct comparison, the 2019 CRF450 made 0.75 horsepower more at 9000 rpm, 2.25 horsepower more at 10,000 rpm. 3.0 horsepower more at 11,000 rpm and 3.4 horsepower more when the rev limiter kicked in at 11,600 rpm. 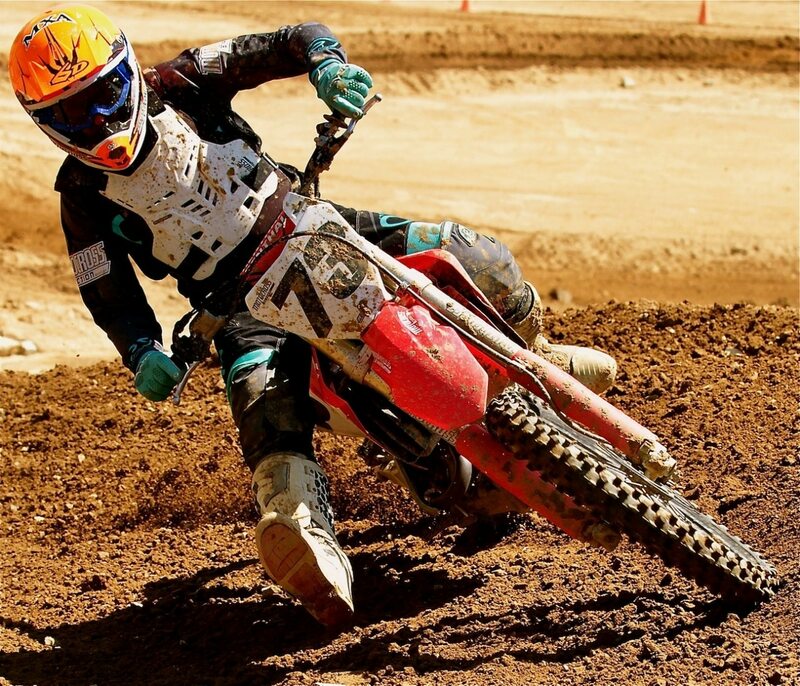 On the track, the CRF450 powerband is supremely useable. The power output is impressive, but equally cool is how linear and smooth the overall delivery is. Since it didn’t increase the hit off the bottom or pump up the low-to-mid transition, the power is very predictable below 9000 rpm. 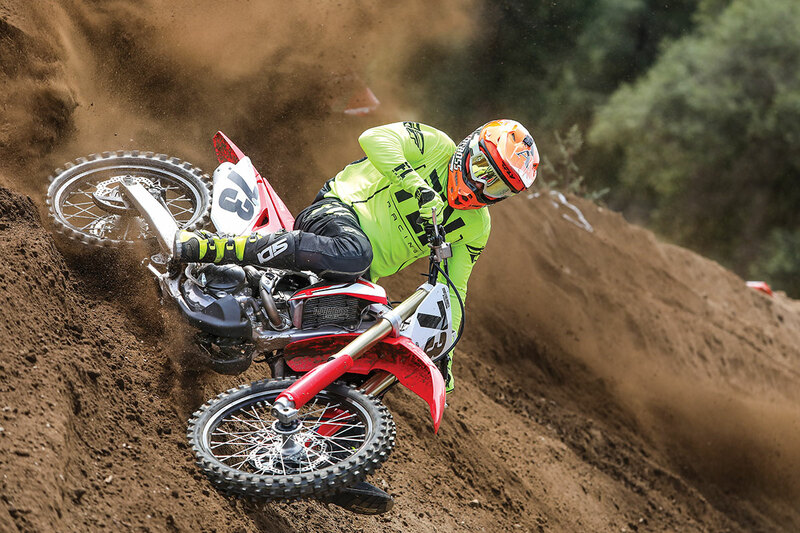 Then, when the top-end hook kicks in, especially at the end of long straights or on short straights with your favorite gear tapped out, the 2019 Honda CRF450 does its best work. And that work must be to work over the competition, because this is a fast motorcycle that is easy to ride—until you get into the part of the powerband where it means business. Previous CRF450s were flat on top. Oh, don’t get us wrong; they revved to 11,600 rpm. But, from 8800 rpm on, it was just noise and vibration. The horsepower went flat and the engine just hung there. 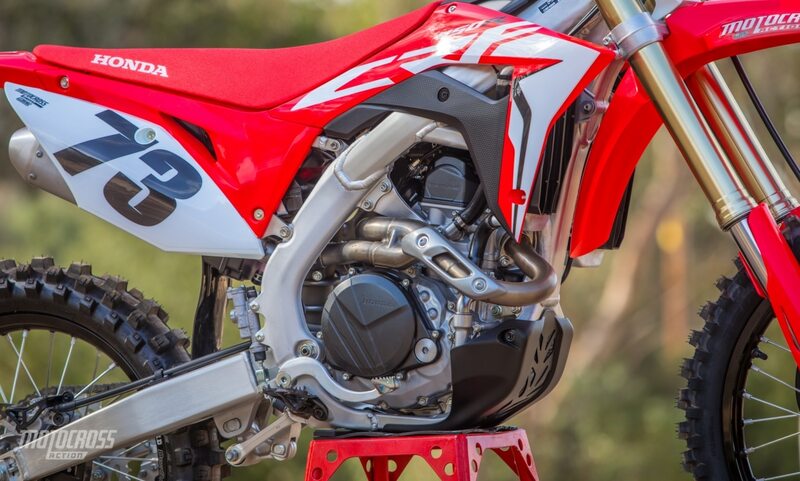 The 2019 CRF450 engine is 33 percent broader than the 2018 engine. When it revs, it doesn’t just scare farm animals in neighboring communities; it makes bacon. 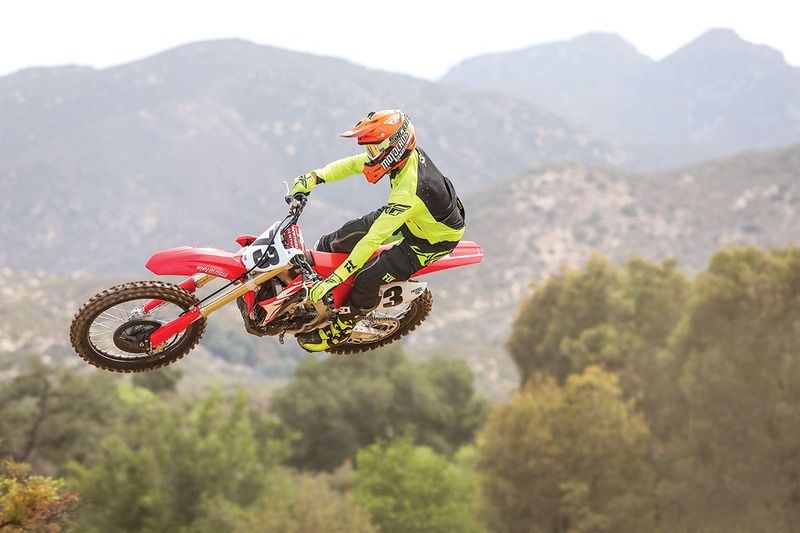 The best handling trait of the 2019 Honda CRF450 is when it’s in the air. It is flickable. Q: DOES THE 2019 CRF450 HANDLE BETTER THAN THE 2018 MODEL? A: No. As much as we liked the 2019 CRF450 at turn-in, we were troubled by the way it felt on the rest of the track. When a brand focuses on turn-in, as Suzuki and Honda did, they give up straight-line stability. On tight and twisty tracks, smooth tracks with jumps or with slower riders, the instability is imperceptible. But, on rough, fast, nasty tracks, especially with a rider who is trying to get every ounce of performance out of the engine, the frame is out of its element. The front end glances off bumps. The head shakes enough to convince mortal men to slow down, and nothing on the chassis seems to work in unison. Worse yet, finding the proper front/rear balance is very difficult because a change to one end seriously affects the other end. We chased setup at every race only to have it feel good in moto one and terrible in moto two. Finding good balance between the front and rear can become a full-time job. It is very hard to find a comfortable setting with the 2017–2019 chassis. This has a lot to do with the Honda engineers’ selection of the Showa fork valving, chassis rigidity, shock rising rate, turn-at-all-costs front-end geometry and stinkbug stance. The CRF450 is fun, fast and exciting. It feels very light in the air but very heavy when leaning it from side to side in the whoops or when it shakes its head down a fast straight. When questioned, MXA test riders raved about how fun, fast and flickable the 2019 CRF450 was in one sentence—and then in the next sentence they complained about it being loose on exit, prone to breaking the rear loose on acceleration and the need to run 108mm of race sag to bring it into balance. The Showa forks are decent, but not great. Q: HOW GOOD IS THE SUSPENSION? A: The Showa coil spring forks are decent for light and slow riders and work well on smooth tracks, but, as a rule, the CRF forks ride low in their stroke, give up the easy travel to sit on a harsh spot, and are a mixed bag of sensations—sometimes too soft, sometimes too harsh and sometimes just right. The rigidity of the frame and stinkbug stance contribute to the fork issues more than the forks themselves. We found that going up on the fork’s spring rate or having the compression shim stack re-valved could bring the forks up in their stroke. Setting the shock at 108mm of race sag balanced out the chassis and made the suspension less erratic. We didn’t experiment with fork oil, but Honda uses a fork oil that has less stiction. Perhaps a cheap fix would be last year’s fork oil. 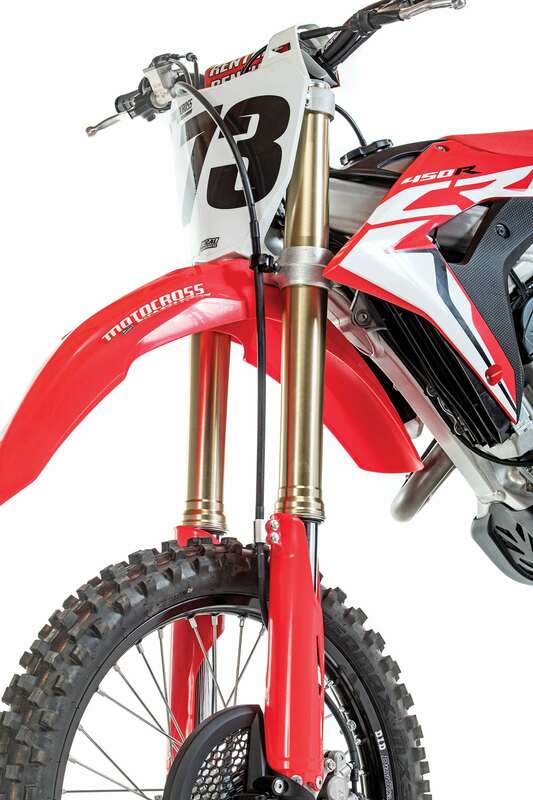 The CRF450 rear shock is very touchy to set up. We set race sag from 106mm to 110mm on the CRF. When racing with the stock forks, we slid the forks down into the clamps to balance out the chassis. Please note: any change to the shock seriously affects the forks. 1. Clutch. The clutch is weak. Get rid of the judder spring (plate, Bellville washer and flat washer) and add a full-size friction plate. If you need to run stiffer clutch springs, use them sparingly, as going stiffer on every spring makes the clutch’s actuation window very small. We run three stiffer springs. 2. Radiators. It overheats and boils water like a teapot—made worse because the radiator guards don’t stop much in the way of dirt. 3. Exhaust. We can’t complain about the horsepower that the exhaust pipe makes, but it is a Rube Goldberg device that increases complexity, cost and weight. We also don’t like how far the head pipe sticks out. Some riders hit their legs against it in berms. 4. Handling. It likes to turn but is busy between corners. 5. Weight. Two hundred thirty-eight pounds is exactly 15 pounds too much. Ken Roczen removed the electric starter motor, battery, starter gear sets and wiring harness during the 2018 AMA 450 Nationals. It saved 5 pounds, but we doubt that Honda will let him do that again. 6. Setup. We never had as much trouble getting a chassis to work in conjunction with the engine and suspension. This is a very sensitive bike. 7. Forks. The forks aren’t as soft as the KX450 forks, yet they don’t have good bottoming resistance. Nobody likes to feel that harsh bottoming sensation. 8. Sound. On the 115 dB 2-meter-max sound test, it blew 117.5 dB. That’s very loud. It did pass the 94 dB Amateur sound test. 1. Horsepower. It is obvious that Honda is over its “slow is better” phase. With 60.21 horses, it is an awesome engine from bottom to top. 2. Ergos. Nothing feels as nice, comfy and well laid-out as a CRF450. 4. Maps. We like adjustable maps, but we always ran the stock one. The aggressive map felt crisper but actually gave up 1 horse everywhere. A: The 2019 Honda CRF450 is a paradox. It is perfect for some tracks and some riders but frustrating for other tracks and riders. The one overpowering characteristic of the 2019 Honda CRF450 is that it makes the most horsepower of any bike in the 450 class—and by a big margin. It has anywhere from a 3 to 6 horsepower head start on every other 2019 bike. If power is what floats your boat—this is the bike for you. This is how we set up our 2019 Honda CRF450 for racing. We offer it as a guide to help you find your own sweet spot. Notes: Don’t be afraid to crank on the compression clickers if you are looking for a suppler feel. We had issues with a very harsh feel in small braking bumps and an overly soft feel on bigger bumps and jump landings. We could not iron it out with the clicks available to us. You have to experiment for your weight, speed and track conditions. Notes: On the 2017 and 2018 CRF450s, we prefer to run longer shock links to lower the rear end and stiffen the compression damping at the initial startup point. On the 2019 Honda, we changed the shock linkage to achieve the same things. If you are light, switch back to 2017’s 5.4 N/m spring, but try softening all the clickers on the 2019 shock by four clicks. The clickers have a fairly significant impact on suspension feel. ASK THE MXPERTS: WHO MAKES THE BEST 4CS FORKS FOR A 45-YEAR-OLD NOVICE?